What do you do when the girl of your dreams decides to marry someone else? Why, stow away aboard her cruise ship and enlist the help of a lovable gangster and an evangelist turned lounge singer to split them up of course. And so begins Anything Goes, the 1934 musical by Cole Porter. 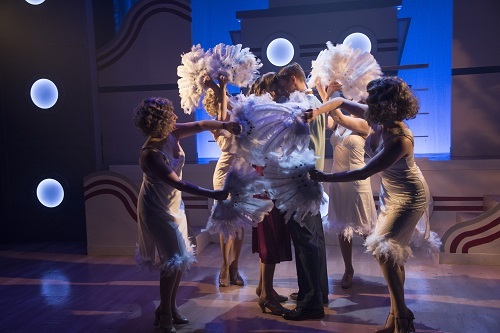 The Lower Ossington Theatre‘s (LOT) 2016 production used period singing, costumes, and dancing to take us right into the glamorous style of the dirty 30’s. Not all of the comedy stood the test of time, with the two, very stereotypical, very painful “china-men” in pointy straw hats being the most glaring example. For the most part, the show is a rollicking good time, with catchy, well-known tunes and lots of fancy, period footwork – including a lively tap dance number, which is not something you see every day in 2016. The incorporation of dance in the musical numbers is one of my favourite aspects of musical theatre, and the choreography in this show, by Michele Shuster, pulled out all the stops. I would like to orchestrate a heist wherein every dress worn on stage last night ends up in my closet, but of course, now that I’ve put that in print, a clothing heist at LOT tomorrow would be pretty conspicuous. Suffice it to say, the costumes were very chic; possessing all of the elegance of The Great Gatsby, with none of the angst. The show also featured some outstanding and energetic performances. Bryden Rutherford, who played love-sick and earnest Billy, has an impossibly clear and sweet voice. Each note had the ring of sincerity and it was easy to root for him to get the girl. Chelsey Maclean gave a bold and charismatic performance as the irreverent and earthy lounge singer Reno. Carrying off a show’s opening number is always a challenge, and even more so when that opener is as recognizable as “I Get a Kick Out of You”. Ms. Maclean found her sea legs early on in the number and carried off this crowd-pleaser with pizzazz. Thomas James Finn was entirely endearing and flat-out hilarious as the harmless and good-natured, small-time gangster Moonface Martin. Mr. Finn is a wonderful singer, but his talent as a comedic actor truly set him apart in this production. All of the performers did a superb job of replicating the brassy, gravely vocals that are a hallmark of this era. If you are looking for a thought-provoking, chin stroking night of theatre, this is not your show. If you are looking for catchy tunes, colourful costumes, spry dancing, and good old fashioned fun, this show delivers. Ticket prices range from $49.99 – $59.99.